Scary Monsters Magazine Presents SCARE-BLOG! Scary Monsters #112 Latest with Augmented Reality Features! Scary Monsters #112 is now available for order here, or you can pick it up at Barnes & Noble or Books-A-Million bookstores, Canada's Chapters/Indigo, comic shops, and some newsstands. Be sure to download the free HP Reveal app to your smartphone to make the magazine come alive with augmented reality! Follow these steps: Create a free account. In the "Discover Auras" search box, type Scary Monsters Magazine #112. A list of Scary Monsters Magazine images will show up. Click on one of the listings for #112, then click on the "Follow" button. Once the Follow button turns blue, click on the "Back" arrow. This brings you back to the listings. Click "Cancel." This brings you to the main screen. Click on the round, blue button at the bottom. Pulsating white dots will appear on the screen. When you hold your phone over certain photos or images (and the cover artwork), film clips, trailers, and sound will be automatically triggered to give you an added experience while reading the magazine. Will you find all the hidden scary treats? Scary Monsters #110 and #111 also have augmented reality features! Voting for the Rondo Awards for 2018 ends at midnight ET next Saturday, April 20. Please consider voting for Scary Monsters as Best Magazine. We also have 10 additional nominations to consider! See the details in the March 2019 section below. To vote, go to RondoAward.com for the official ballot. Either copy and paste the entire ballot into an email message (or vote in only the categories you want by number), include your name in the email message, and send to taraco@aol.com. Thanks for your scary support! Ronald D. Sweed, better known as The Ghoul to late-night TV viewers in Cleveland and Detroit over the past several decades, has died. Born Jan. 23, 1949, in Cleveland, Ohio, he suffered a massive heart attack in November 2018 and reportedly underwent triple-bypass surgery. "Loving husband of 26 years to Mary Terese Matousek, son of the late Irene and Robert Sweed, cousin of Janice Steffek, brother-in-law of Paul Matousek (Joanne) and Frank Matousek (Kara Mostowy); and uncle of Mark, Nicole, and Lindsay Matousek. Ron was a friend to all, kind and loving, outgoing, and welcoming. He was quick with a laugh or a smile, and had a wry sense of humor. He was also known as television and radio personality The Ghoul, entertaining generations of fans since 1971. Ron was a huge fan of The Beatles, meeting them on several occasions. His Beatles film footage was featured in Ron Howard's Eight Days a Week documentary (2016). He was an active member of St. Mary of the Immaculate Conception Parish...."
Thankfully, Scary Monsters had the opportunity to talk at length with him for our fall issue in 2017 (Scary Monsters #106). Look for a tribute to him in an upcoming issue. Thanks for all the laughs and spooky good times, Ron! You will be missed. 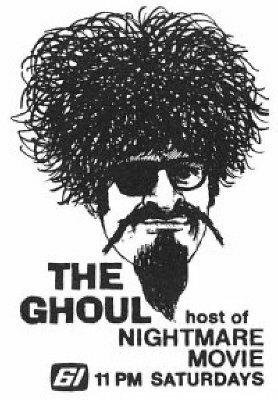 Starting at WJW-TV as a production assistant for Ghoulardi, Ron Sweed would, with the permission of Ernie Anderson, revive the Ghoulardi character when Anderson left for Hollywood. But Sweed dubbed himself The Ghoul and launched a new show on WKBF-TV Channel 61. The show would be syndicated in several cities through the late 1970s. The Ghoul Show would go off the air when WKBF shut down but returned to TV a few more times through the late 1990s. Pluck your magic twanger, Froggy! Vote For Scary Monsters in the Rondo Awards! The official voting-by-email ballot for the 17th Annual Rondo Hatton Classic Horror Awards has been posted, and voting is now open! The awards only cover work completed or published in 2018. Following is our suggested voting slate, which includes a list of 11 Scary Monsters nominees in categories #14–18 from 2018 issues of Scary Monsters and four nominees related to Scary Monsters in categories #19, 21, 22. We also have a couple suggested write-in votes. To see the entire ballot, go to RondoAward.com or the Classic Horror Film Board located at Tapatalk.com. “Halloweens to Remember: Creature Double Features to Never Forget” by Spence Connolly, Scary Monsters #110. A personal journey through horror. “Insidious Insects Invade” by Mark Glassy, Ph.D. Scary Monsters #107. The creepy truth behind those giant bug movies. “Monsters in the Living Room,” Parts 1–3, by Jim Ivers. Scary Monsters #109–111. A decade-by-decade look at horror on television. “Universal’s First Mad Scientist” by Kurt McCoy. Scary Monsters #110. Revealing Prof. Singleton in 1915’s The Eleventh Dimension. John Karlen (Dark Shadows) by Rod Labbe. Scary Monsters #108. Russell Streiner, Judith O’Dea, John Russo, Kyra Schon (Night of the Living Dead) by Dr. Gangrene. Scary Monsters #110. 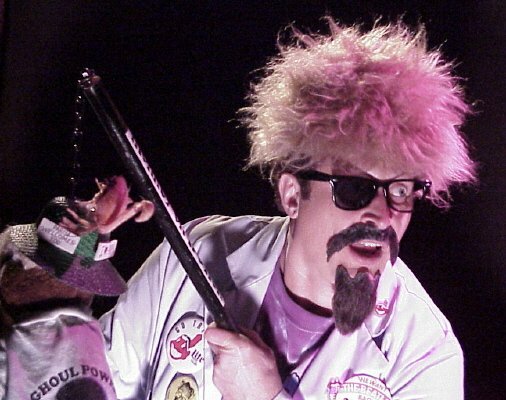 Dr. Gangrene’s Mad Interviews, Scary Monsters. Kaiju Korner by Mike Bogue, Scary Monsters. Strange Days by Jason Strangis, Scary Monsters. 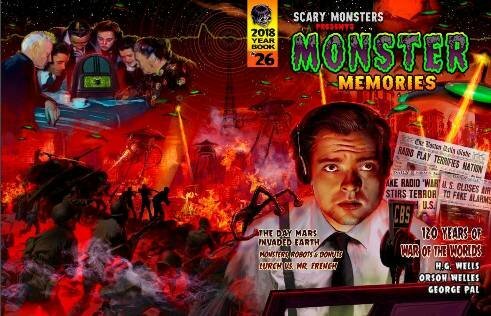 18) Best Cover – Scary Monsters Presents Monster Memories #26 by Scott Jackson. Dr. Gangrene’s Mad Blog. Nashville’s multimedia horror host. Terror from Beyond the Dave. A singular version of horror madness. 21) Favorite Horror Host – Dr. Gangrene Presents. 22) Best Convention – Monster Bash (Mars, PA). 28) Best Fan Artist of 2018 – (Write-in Vote) Earl Cagle, Scary Monsters. Rules: One vote per person. You don’t have to make a selection in every category, and write-ins and comments are accepted. For your vote to be counted, you must include your name and submit your picks via email to taraco@aol.com by midnight, April 20, 2019. You can copy the ballot from the website (RondoAward.com) or from the Classic Horror Film Board and paste the ballot into your email message. Vote by placing an X next to your selection(s). Deadline is midnight, April 20, 2019, for completed ballots to be sent via email to taraco@aol.com. Special Offer for Scary Monsters Readers! In our Scary Monsters #111 It's About Time, It's About Space Issue (now available for order on this website and at Barnes & Noble, Books-A-Million, newsstands, and comic shops, writer/interviewer Rod Labbe interviewed Dark Shadows star, actress, and author Kathryn Leigh Scott. In the interview, she announced a special deal for Scary Monsters readers on her coming-of-age vampire book Dark Passages. Click here to order! Limited time offer. She will sign your copy by request, too. Thanks Kathryn and Rod for helping us keep things scary! Our second augmented reality-capable issue of Scary Monsters is going out to subscribers and those who ordered copies online or by mail order. Barnes & Noble, Books-A-Million, Chapters/Indigo (in Canada), newsstands, and comic shops should have it available in the next couple weeks. Be sure to download the free HP Reveal app to your smartphone to make the front and back cover -- as well as at least 19 of the 144 inside pages -- come alive with augmented reality! This means that when you open the app on your phone and hold it over certain photos or images (and the cover artwork), film clips, trailers, and sound will be automatically triggered to give you an added experience while reading the magazine. Here's a hint: the first inside page with the AR feature is page 25. See if you can find the rest! Also, if you haven't done so already, pull out (or purchase) Scary Monsters #110 to view and hear the surprises hidden in that issue -- our First Annual Halloween Spiritacular. So, enjoy going back and forward in time with us with Scary Monsters #111! Merry Christmas, Happy Holidays, and Happy New Year to all of our scary customers! One of Scary Monsters magazine’s top writers is featured in the Scary Monsters #110 They’re Alive Again Issue now shipping (Order Here). The feature article tells of the involvement of Mark C. Glassy, Ph.D. in a major exhibit titled "Mark Glassy and Frankenstein: Men of Many Parts" that has opened at the University of California at Riverside and runs through December. Guided tours are also scheduled. Click here for info and to register. Be sure to watch the wonderful video on Mark at the bottom of the UCR web page. 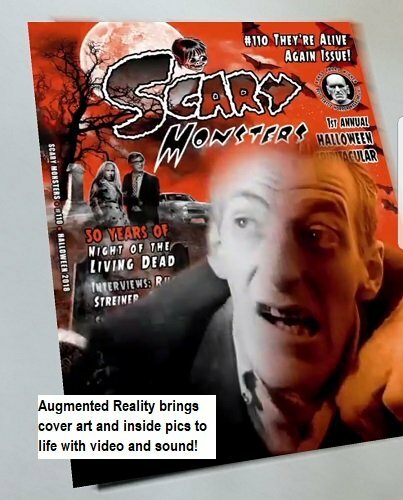 Scary Monsters magazine’s #110 They’re Alive Again Issue coming the first week of October 2018 is not only its First Annual Halloween Spiritacular, but it’s the first to be Augmented Reality-capable! 1. Download the free "HP Reveal" app to your smartphone from Google Play, iTunes, or other app stores. 3. In the "Discover Auras" search box, type Scary Monsters Magazine (for issue #112, search for Scary Monsters Magazine #112). A list of Scary Monsters Magazine images will show up. Click on one of the listings, then click on the "Follow" button. Once the Follow button turns blue, click on the "Back" arrow. This brings you to the listings. Click "Cancel." This brings you to the main screen. 4. Press the round, blue button on the bottom of your phone’s screen. You will see white dots pulsing in and out on the screen. Now you’re ready. Hold your phone over the front cover of #110. Actor Bill Hinzman will come alive. Try the back cover next. Yikes! Then move on to the inside pages. There are a dozen photos inside that come alive! Will you find them all? You can expect subsequent issues to have Augmented Reality features as a little extra to our readers! Scare you later! There was something about the slimy kelp that was frightening! 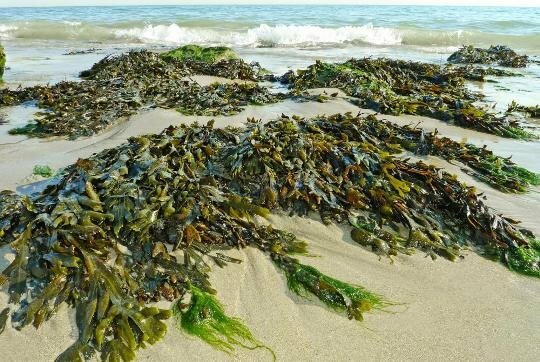 I was swimming in the ocean in front of my summer bungalow in South Jersey when I first encountered the seaweed and, for the first time in years, thought of Eel Harris. It had been a hot, sticky August day , and the breeze came from the inland and brought no coolness but only flies. Wearing only a bathing suit, I had worked as long as I could at the papers I had brought down from the office for the weekend. But at last I yielded to the heat and walked across the beach and into the water. It was cool and green and refreshing, and I started to swim out to the breakers. After a few strokes, my hand pushed through a patch of seaweed. As I shook my hand to get rid of the weed, the end slapped clammily around my neck. I guess I got excited and started to thrash because I was soon entangled in several strands. A large wave threw me back into shallow water, where I could stand and peel it off. The seaweed was tough and rubbery and was in long, wrinkled streamers like the crepe paper we used to use for party decorations. It had hard brown nodules like staring, malignant eyes, and it seemed to wrap around my hand when I pulled it away from my body. It was completely different from the Christmas-garland-like weed that grew in Bass Lake. And yet, as I hurled the distasteful stuff far into the breakers, it made me think of Eel Harris and my boyhood summers. It had been so long since I had thought of Eel that it took several minutes to remember that his first name was Charles. We called him Eel because he was so good at swimming under water. His favorite trick was to snake around under water, fluttering his feet slightly to keep moving, and suddenly pull some unsuspecting person under. As he pushed his victim further to the bottom of the lake, he’d come to the surface and bellow, "Set ’em up in the next alley!" Then he’d be off for someone else. We were enemies without actually fighting. I never understood why it was, but I know he never missed a chance to taunt me or torment me with the most painful roughhouse. When the gang went swimming at Bass Lake, he certainly dunked me more and held me under longer than anyone else. "Well, the Twerp," he would say, spitting more water than necessary as he confronted me. "Let’s see if you can break this simple, little hold." Under I’d go, struggling vainly against his hammerlock, until he scornfully shoved me to the surface. I had always been repelled by the water weed that grew so abundantly in Bass Lake. Once I inadvertently swam through a patch of it, and when I got it wrapped around my arms, I became panicky and started to struggle instead of pulling out slowly. I got thoroughly tangled in the stuff and lost my head. I was under water and my lungs were bursting. And still I thrashed against the weed instead of swimming to the surface. A couple of fellows pulled me up and dragged me to the float. As I sat there panting and persistently removing every trace of the hateful, clinging strands, Eel clambered up with a handful of weed. He draped some around my head in a crown and proclaimed regally, "Guys, meet the new Water King. He can’t even fight his way out of a bed of seaweed!" The others roared with laughter, and Eel knew he had a wonderful joke. After that, I always went to pieces when I encountered water weed. Eel took advantage of this, and for the rest of that summer, he always had a bunch of the weed handy so he could throw it over my arms and hold me under while I struggled frantically with it. One time I was so frightened I almost didn’t make it to the surface when he let go. From then on I never went in the water if Eel was near. The following year I beat Eel in the competition for the college scholarship. He hated me for it. "I’d have won if he hadn’t cheated!" he told anyone who’d listen. When they didn’t pay any attention to him, he muttered menacingly, "I’ll get even with him some day." Before that he had only been playing. But now I knew he was really out to hurt me. I didn’t go to Bass Lake at all after that. In the fall, I went to college, and Eel went to sea. After a while I stopped thinking of him and forgot my fear of water weed -- until that day in the ocean. I knew it was foolish, but after that I was afraid to swim in front of my bungalow. Even on the hottest days, I trudged a half mile up the searing sand to the public beach where there were always several lifeguards. A few weeks later, a storm washed in great quantities of seaweed. I felt a peculiar sense of dread at the thought of swimming in it even under the eyes of the lifeguards. But the day was hot and glaring, without even a whisper of a breeze to disturb the big, buzzing, biting, green bottle flies, and my eyes hurt from squinting in the sun. The cool, green ocean was so inviting; I went in anyway. Everywhere I went in the water there seemed to be seaweed. Soon I was tangled in it, and my old fright came back. As I struggled to be rid of it, a wave knocked me off my feet. I struggled to get to my feet and to shake off the clinging seaweed. As soon as I shook off one piece another wrapped around me. One piece wound around my throat -- like a pair of slimy hands trying to choke me! As I fought against the weed, and struggled to come up for air, I realized with a horrible, sickening dread that the weed was actually fighting against me! It was hindering me so much that I was being swept out to sea! Somehow, I must have yelled for help, because the lifeguards came and dragged me out. They pulled the seaweed off my trembling body, and even then, it still seemed to clutch me as though it were waiting for a chance to drag me back to the depths of the sea. "You shouldn’t fight the undertow like that, Mac," they said, as they said to everyone they pulled out. "Just relax, and you can get to the surface and let the next wave carry you in." Then they sent me home for a rest. I wish I could be sure it was just the undertow -- because when I arrived at the bungalow, the mail included my hometown newspaper. One story on the front page started, "Charles Harris, a former resident, was reported lost at sea off the New Jersey coast last month...." I didn’t read any farther. I know I’m not going to go swimming anyplace again.